Here are our final three accounting-related recommendations for the owners of new up or young companies. 4. If you have employees, hire an outside payroll company. When you hire your first employee, it’s time to hire Paychex or other reputable payroll company. An outside payroll company will handle all the pay and tax calculations, create physical paychecks or direct deposits, send the taxes to the correct agency on time, and file all the payroll tax returns. They can also handle garnishments, retirement plans, and most other payroll-related items. All this will cost you between $75 and $150 per month if you have less than 10 employees and pay your employees once or twice a month. Your own time as a business owner is too valuable to do payroll yourself. And you don’t want to be dependent on an employee or bookkeeper to do the payroll — you are then totally dependent on that individual. Also, don’t fall for the argument that you can do payroll cheaper yourself in-house or using the local bookkeeper. Payroll companies can process payroll much more efficiently than any individual or small firm. Finally, if you are handling payroll yourself and you miss a tax deposit due date by just one day, the late payment penalty could easily exceed the cost of your payroll processing for the entire year. 5. Insure that your bookkeeper reconciles bank and credit card statements monthly and investigates transactions that don’t clear. One of the first things we look at when evaluating a new client’s accounting systems is their bank and credit card statement reconciliations. Are the reconciliations current and are there few or no old transactions in their accounting software that have never cleared the bank? If the answer to both of these questions is yes, then it’s very likely that the overall books are in good shape. As a business owner, you want your bookkeeper to reconcile your accounts monthly so that you are sure that all transactions all recorded–it’s easy to miss automatic payments or manual checks you wrote. Another important step that many bookkeepers fail to do is to review the transactions in your software that have not cleared the bank. This step could help identify critical errors. For example, if you don’t review uncleared transactions, you might not notice that a deposit hasn’t cleared the bank? (Did you forget to take it to the bank, did you record it in the software twice in error, did the bank credit the wrong customer, etc.?) To address this recommendation, we recommend that business owners require their bookkeepers to give the owner the bank and credit card statement reconciliations each month and to provide a list of all uncleared transactions with an explanation for each. 6. If you sell your and your employees’ time, use a web-based time tracking product. There are now numerous web-based time tracking options for time tracking. Most include the ability to track time on smartphones or tablets, so the track tracking can be done in field while work is in progress. Using time tracking software can help increase your billable hours by eliminating hours you have forgotten to record. Also, if you select a product that syncs to your accounting system, you will always have current client names available in the time tracking software and you can get your billable hours into your accounting software automatically for invoicing and cost tracking. For example, at our firm we use a product called eBillity which syncs into our QuickBooks software. 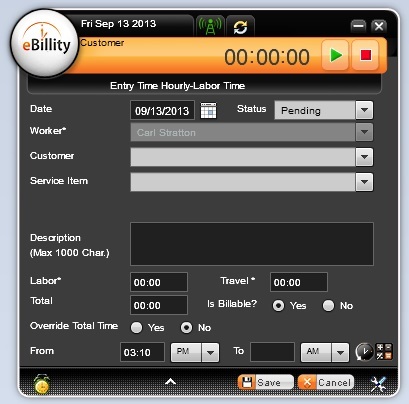 The time entry screen for eBillity is shown at right.